Last week it was time for all the seedlings we’ve been growing to be collected by our friend Bish for the St Michael’s School Kaleen Fete (Friday 25 October from 5 to 8 pm). So what better time to have her and our other gardening friends over for lunch. 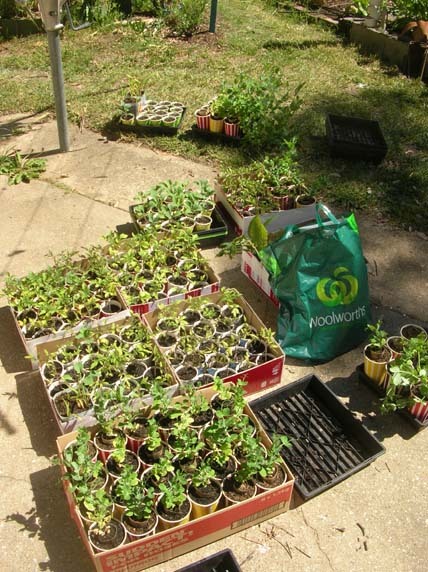 Almost all of the seedlings for the fete. 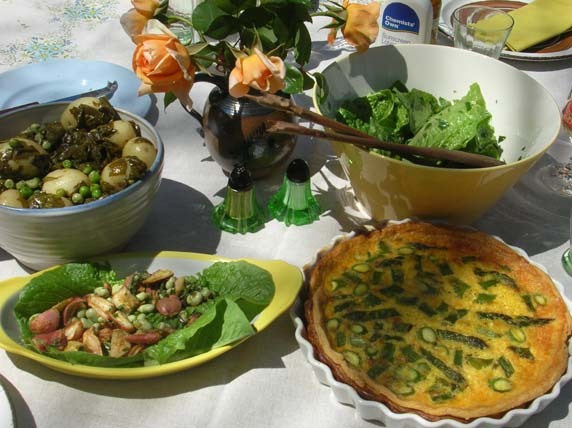 We ate a very tasty quiche of asparagus and home cured bacon, with some tasty cheese added and six of our ‘girls’ glorious eggs. There was a leafy cos lettuce, rocket, parsley and tarragon salad with an Asian dressing; Hugh F-W’s always reliable potato salad with wilted sorrel and this time extra spring peas; and J bought along a radish salad from her plot and a lovely bouquet of Lady Huntingfield roses for the table. (Lady Huntingfield, named after the wife of a Governor of Victoria, is an Alister Clark rose). And just when you thought you’d had enough TB brought out his lime flan that was made with our Red Centre Desert Lime/Mandarin cross. 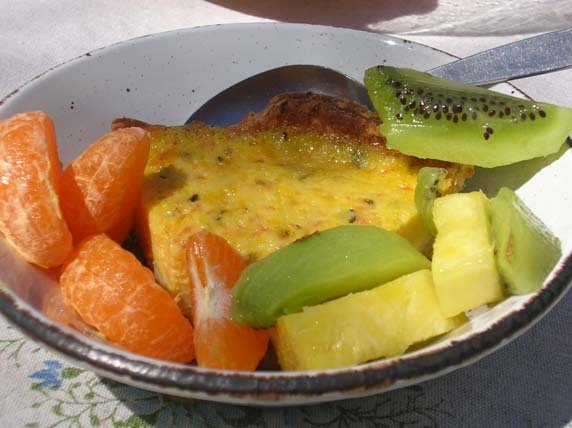 The pineapple, kiwi fruit and mandarin are all ‘ring ins’, not from a Canberra garden alas. Dessert featuring Desert Lime flan with fruit (none of which came from our garden). For post-lunch sport we played pack Bish’s car full of plants. She certainly had the latest in mobile nurseries for her drive home! About 2 weeks ago I saw the first of the Christmas lights going on sale so that can only mean that Christmas gift buying mania will soon be assailing us all. If, like us, you already have too much ‘stuff’ then perhaps you might be open to taking a radical turn and giving an Oxfam Unwrapped gift instead. It’s simple you buy something that someone really needs like animals, seeds, clean water or a literacy program and your recipient gets a great card, either real or an e-card, not to mention a warm feeling. There are lots of gifts at a variety of prices, so you could even give yourself a gift! I’ve long been inspired by our native bushland, particularly heath and grassland communities. 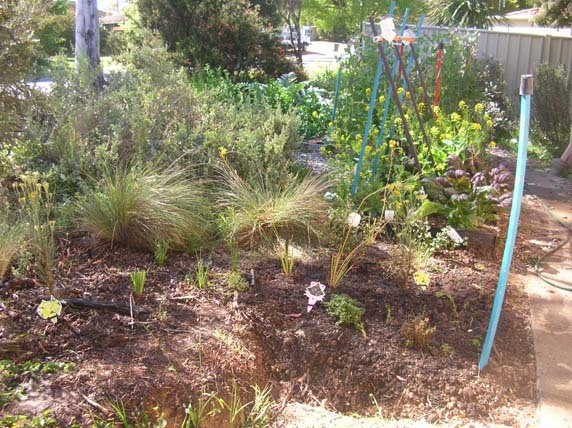 But as those who have experienced the notion that ‘Australian native gardens don’t need any work’ find out the hard way, just shoving lots of plants into the ground doesn’t result in an attractive landscape. While my garden has worked rather better than that I’ve never quite managed to achieve the look I was after. As many of my original plantings are now starting to go downhill it is definitely time to give it another go. The practical inspiration for my garden renovation has come from two books that I read over the winter months. First off was The Layered Garden: design lessons for year-round beauty from Brandywine Cottage, by David L Culp with Adam Levine. In this book Culp ably demonstrates how to make a garden with year round interest, based on a woodland approach in his own garden in Pennsylvania. At first Planting: a new Perspective, by Piet Oudolf and Noel Kingsbury, with a very scary array of planting guides seemed rather daunting, but the authors use the planting schemes to demonstrate a basic formula for planting that promotes interest throughout the year. This is a mix of plants that are fixtures of the garden year round and those that literally or figuratively disappear or recede for long parts of the year. I’m probably not explaining this too well, so I urge you to give the book a go. I found it a pretty interesting read with lots of wonderful illustrations to go with the words. So where to begin. My choice of ground to start this work, as you can see, is not very promising,but it is on the other side of the yard from where we found the termites. Until the termites go I can’t dig where they might be disturbed. This will be a garden renovation of many parts. A sorry piece of ground for a new garden! I spent the morning clearing the area. At least the chooks were happy to get all the weeds that I dug out. 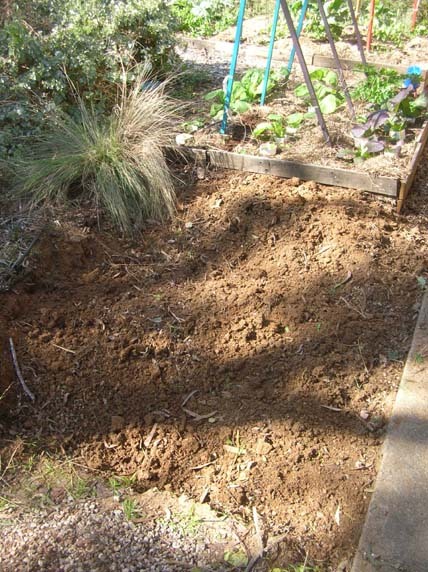 By the time I finished the initial digging and adding some compost things were looking rather better. The space is only about 1.5 metres square so its not a lot to start with. Newly dug over, things are looking up for my garden. I spent the next few weeks adding a lot more compost and doing a lot more digging in of manures before I started planting. My feature plants are two varieties of pink flowering Correa, Correa pulchella X ‘Pink Carpet’ and Correa ‘Annabell’; the yellow flowering shrub Ozothamnus diotophyllus ‘Gold Dust’ and Zieria prostrata ‘Carpet Star’. The taller plants will grow about 1 metre in height and the two ‘carpet’ plants will spread between 1-2 metres. I’m also using Pelargonium rodneyanum (Magenta Cranesbill) as a filler plant. This will gradually spread around the garden and can be dug out if it gets too exuberant. The remaining plants in this area are ephemeral annuals. I’ve included plenty of Wahlenbergia sp (Native Bluebell) and several plants of the Bulbinopsis bulbosa (Bulbine Lily). 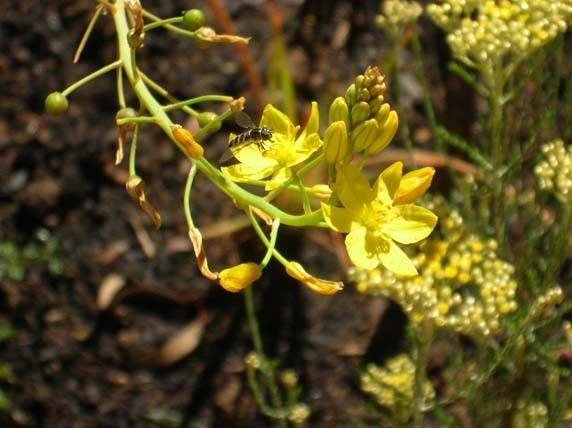 The Bulbine lillies are still flowering wildly attracting plenty of Hoverfly’s which are a great garden predator, as well as a common pollinator of Australian plants. I’ve also dug out and divided a clump of one of the most striking of our local plants Eryngium rostratutm (Blue Devil) which has the most stunning spiky blue/purple flowerheads. I’ve planted the new pieces in several places around the garden to encourage the spread of this handsome plant. 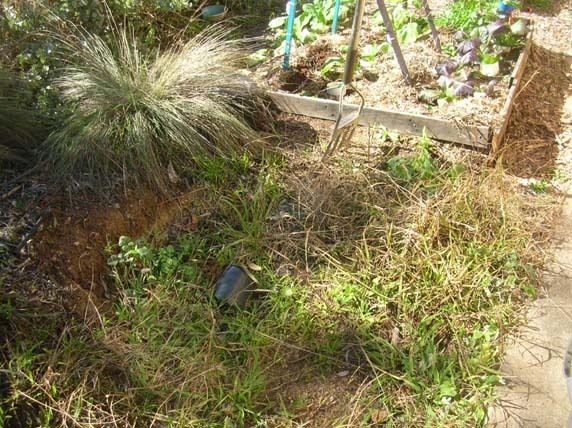 You can see from the photo below that I aim to keep the majority of the plants in this part of the garden fairly low. This allows the winter sun into the front of the house. The new section of front garden. I’ve also extended some of the planting into the existing garden, adjacent to the new section. I hope in this way to start integrating the newer plantings with the existing garden. At least I’ve managed to get some of those poor plants that I bought pre-termite moratorium, into the ground. Now I have to go and pot on the remaining plants so they can survive until I get the all clear to continue the renovation. 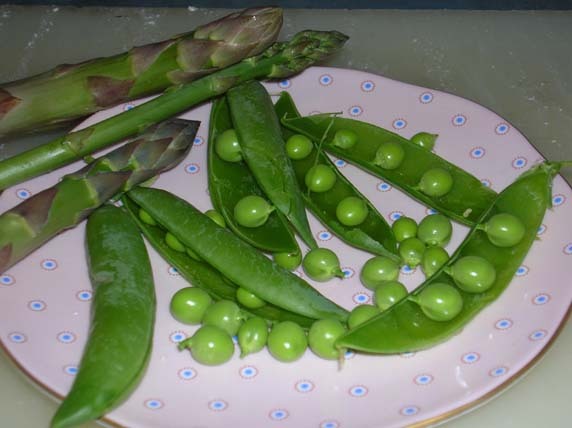 With spring well underway all those peas I planted out several months ago are now starting to deliver. We had our first meal incorporating them last night – TB’s version of Mapo Tofu with some peas and asparagus for added flavour. 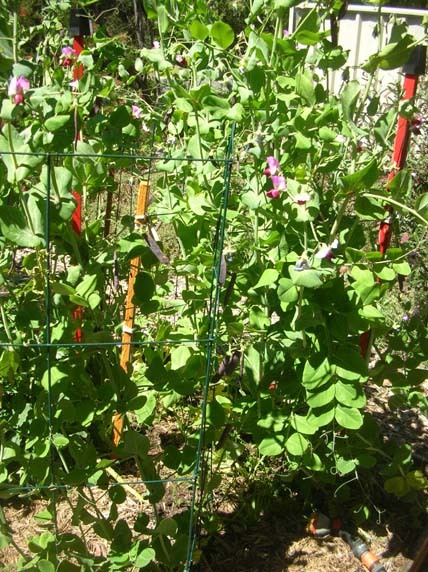 Massey bush peas, great for a small garden. 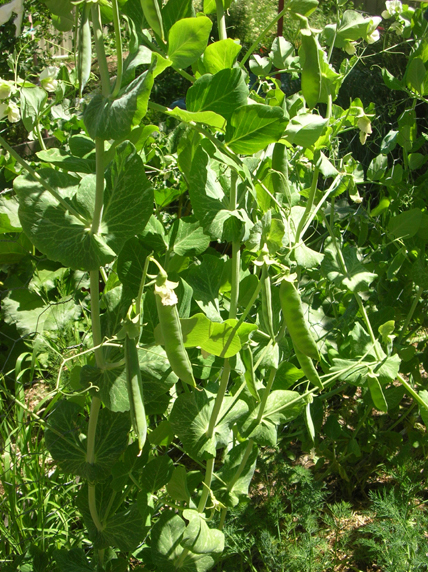 The first out of the pod are the Massey bush pea (above) which grow lots of pods on compact bushes. They are great for a small garden. It will only be another day or two before we start harvesting our climbing peas. This year I have planted Alderman and Purple Podded Peas. The Aldermans are galloping up the wire so quickly that we’ve had to tie a rather Heath Robinson arrangement of ex-curtain trim around the top of the stakes to try and provide some more support. I’ve planted my favourite Purple Podded climbing peas in the front garden, where their striking two tone pink and purple flowers have already been mistaken for sweet-peas by a passing neighbour. Purple Podded Peas, both the flowers and the pods make an attractive display. I do plant some peas just for the shear pleasure of their flowers. I love the many varieties of Australian native peas, such as this Mirbelia oxyloboides. I purchased this plant from a weekend market while I was on holidays in Bairnsdale several years ago – now I wish I’d bought more. These plants bring to mind a scene I experienced in Namadgi National Park many years ago. 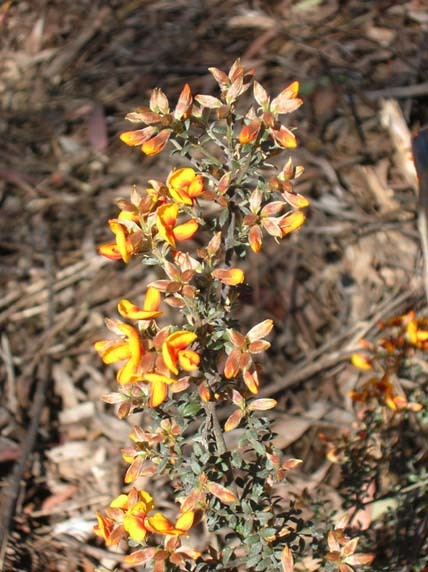 Walking along the fire trails at Mt Ginini we could see the surrounding mountain slopes covered with thousands of flowering orange pea plants – quite amazing! 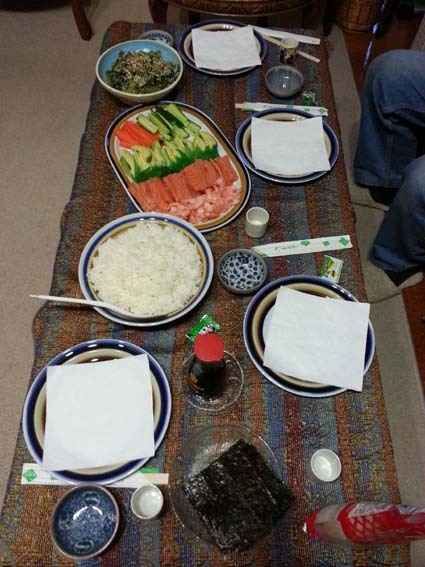 Several times a year we get together with our Japanese teacher and fellow language students for a shared meal. One of the easiest meals we have is temaki sushi (alternatively spelled temakizushi), or hand made sushi. This is definitely a fun meal to share with friends or family. The sushi table is set. If you like sushi but are completely put off by wrestling with bamboo mats to roll your sushi then this approach could be the one for you. All that you need is your sushi rice, some nori (seaweed) sheets and a plate of sushi fillings. Don’t panic if you can’t find sheets of nori, you can always use a lettuce leaf instead – no toasting required! 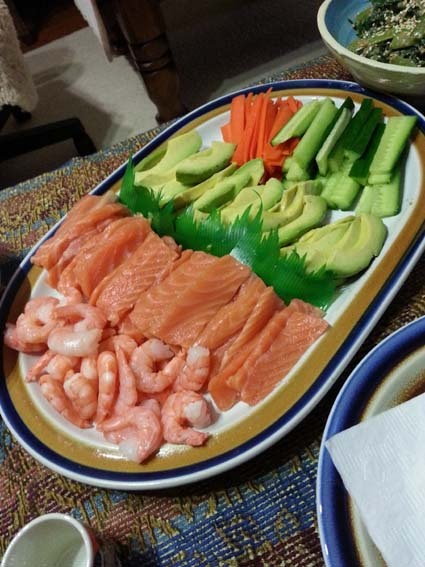 Cooked prawns, tuna, avocado, cucumber and carrot are ready to roll. First you take your sheet of nori and ‘toast’ it by holding it over your gas burner (or other heat source) for a few seconds. Then tear your large sheet into four pieces. Now you are right to go. 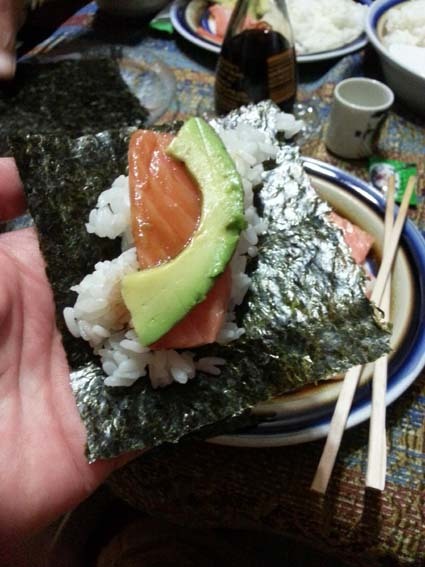 Take your piece of nori in your hand, put some rice on top of it and then add the fillings that you like. Then roll the nori over the filling. That’s it, well apart from the eating. In addition to the platter prepared by our teacher TB made some crumbed and deep-fried pork strips (pork tonkatsu)- using panko as the crumb coating and a dish of spinach with sesame dressing (horenso no goma ae). 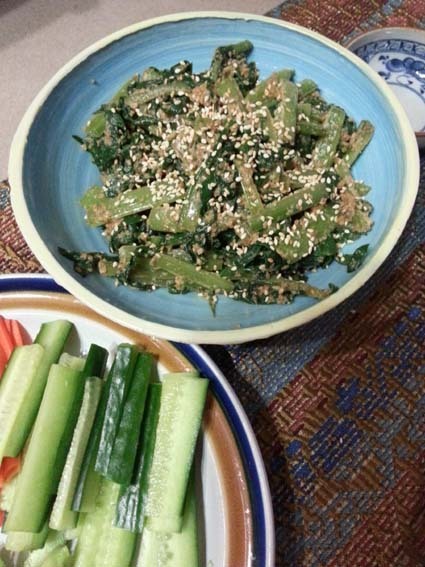 The latter dish is blanched spinach which is coated with a dressing of 50 grams of white sesame seeds; 1 &1/2 teaspoons of caster sugar; 1tablespoon of sake, 1&1/2 tablespoons of dashi and 2 teaspoons of temari. Dry fry your sesames seeds over a medium heat until they are lightly golden then grind them in a motar and pestle adding the sugar, sake, dashi and tamari until it forma a paste. toss the spinach in the dressing and serve. (This recipe is from A Little Taste of Japan, by Jane Lawson, Murdoch Books 2004). 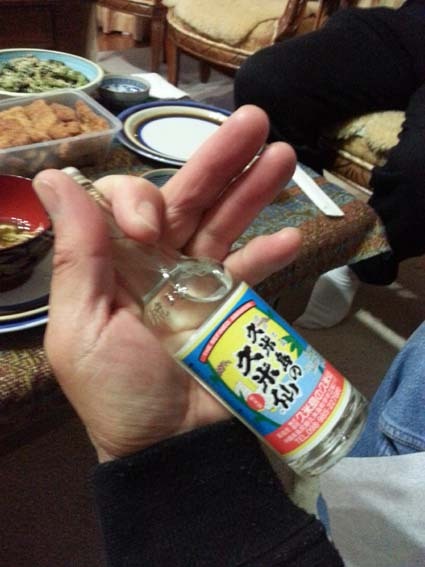 We also drank some Okinawan rice liquor, think shochu rather than sake, with our meal, courtesy of our teacher who brought it back from her recent visit to Okinawa. If you would like to see the full process for making temaki sushi, including some more complex preparation, this is a good video to watch. The week after writing this post Adam Liaw made temakizushi on Destination Flavour Japan – talk about being on trend! You can check out Adam’s version here.